BEST OF THE YEAR NODS FROM AMAZON, THE WASHINGTON POST, AND USA TODAY'S POP CANDY BLOG! 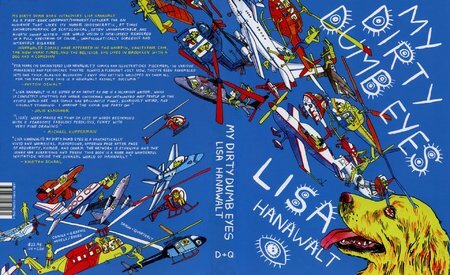 My Dirty Dumb Eyes introduces Lisa Hanawalt as a first-rank cartoonist/humorist/stalker for an audience that likes its humor idiosyncratic, at times anthropomorphic or scatological, often uncomfortable, and always sharp witted. Her world vision is intricately rendered in a full spectrum of color, unapologetically gorgeous and intensely bizarre. With movie reviews, tips for her readers, laugh-out-loud lists and short pieces such as “Rumors I’ve Heard About Anna Wintour,” and “The Secret Lives of Chefs,” Hanawalt’s comedy shines, making the quotidian silly and surreal, flatulent and facetious. Hanawalt’s comics have appeared in the Hairpin, VanityFair.com, the New York Times, and the Believer. She lives in Brooklyn with a dog and a comedian.